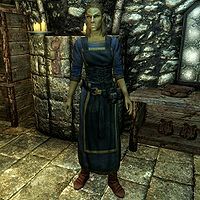 Endarie is an Altmer tailor living in Solitude. She runs Radiant Raiment along with her sister Taarie, and she can be found behind the counter in the store while Radiant Raiment is open. She sleeps from midnight to 8am, then wakes up to work in Radiant Raiment. At 8pm she closes the store and spends the rest of the day relaxing around the store. Endarie wears a set of merchant clothes and boots. She carries the key to the store and a selection of common items and gold. When you approach her, she may greet you with "Oh, what delight. Another charming customer..." or "Let me just drop everything to help you. I don't mind. Really." If Taarie is alive, Endarie may also tell you, "I can help with purchases, but if you came to talk, see my sister. She's the one who gets on with people. It's her one virtue, really." If you have raised her disposition, however, she will be more amicable, as she will greet you, "So good to see you again. How can I be of service?" When you part ways with her she can be heard saying, "Finally..." or "Thank the gods for the end of yet another pointless conversation..."
You can ask her if she is having a bad day, to which she will reply, "It is when my customers waste time chatting, and not buying." or "You'd think so, wouldn't you? I'm fine. Thank you for asking." if you have completed Lights Out!, Tending the Flames, or The Wolf Queen Awakened. You can ask her if the store gets much business with her hostile attitude, and she responds by saying that they get business by having the best clothes in Skyrim. If you ask her after you complete any of the three quests above, she will recognize you and compliment you for it. Taarie: "Sister dear, could you try sewing those sleeves a little tighter? We can't have our customers looking sloppy because of your work." Endarie: "Oh certainly, dear sister. We couldn't afford to have our customers look like the simple pigs they are, now could we?" Taarie: "Good. And while you're at it, perhaps you should sew your mouth shut when our fine customers are within earshot, hrm?" Irnskar: "My lady, I'm pleased to inform you that you have a new gown for court, specially tailored by madame Endarie." Bryling: "Really? How did we afford that? Besides, I like the gown I already have." Irnskar: "Madame Endarie insisted. She made it free of charge, in honor of your lenience about last month's rent discrepancies." Bryling: "That was suspiciously nice of her. I thought she hated everyone." Irnskar: "She does, my lady. But apparently, she hates you just a little less than the others." This page was last modified on 28 July 2016, at 17:43.